There are discrepancies in the specifications that one may observe in the leaked videos of Sony Ericsson Xperia X7 and Xperia X7 mini as seen on Youtube. Yet these screenshots seen on you tube have tentatively confirmed the existence of upcoming smartphones from Sony Ericsson to be based on Windows 7 operating system. Hence, we may say that new smartphones from Sony Ericsson are based on Windows Phone 7 OS and these handsets are the Xperia X7 and the X7 Mini. 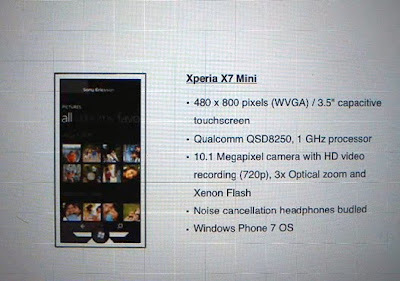 These WP 7 enabled phones of Sony Ericsson, referred to as Xperia X7 and Xperia X7 Mini, are expected to launch in first quarter of 2011. Sony Ericsson turned from Symbian OS to Windows 7, considering that Symbian OS lacked “ecosystem”. Getting again to the specifications of these phones reveal that there is a 8.1 MP camera with HD (720p) video recording in the Xperia X7 and in the inferior version, the Xperia X7 Mini, there is a 10.1-megapixel camera. It gives us enough reason to think and re-consider the fact that news about these phone is true or not. 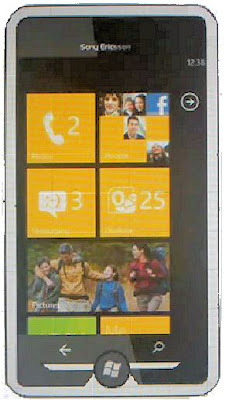 The two smartphone gadgets fit the Microsoft’s Windows Phone 7 hardware specifications. In Sony Ericsson Xperia X7, there is a 4.3-inch wide capacitive WVGA display and it runs on a 1.2 GHz Qualcomm MSM8260 processor. As mentioned above it also boasts of an 8MP camera with ability to shoot 720p HD video. There is HMDI-Out and for a great sound effect, Dolby Digital Plus surround sound feature is also present in it. In its slimmer and smaller version, the Sony Ericsson Xperia X7 Mini, there is a smaller 3.5-inches wide WVGA display. Similarly, its processor is slightly less powerful and rated at 1GHz. It is Qualcomm QSD8250, the one that is present inside the Nexus One, the Google smartphone. Its 10.1MP camera that shoots 720p HD video, comes with 3x optical zoom and a Xenon flash features that makes it stand out in the crowd. Such a technologically advanced camera is lacking even in Nokia N8 which was hyped to have the best camera. Windows Phone 7 lovers getting this OS in Sony Ericsson handsets must now be eagerly waiting for these handsets to launch and we too hope it happens to be really happening soon.